You can find Aboriginal sites everywhere in Australia. Even in heavily urbanised environments like Sydney many Aboriginal places survive. This guide outlines different Aboriginal sites and explains what Aboriginal people used them for . 'Occupation site' is a general term for a place where Aboriginal people lived and used the natural resources, for example rock shelters, quarry sites, middens and open camp sites. Cockle shell in an Aboriginal midden. Many walking tracks in Sydney's national parks lead past or through Aboriginal middens, but only a trained eye is able to spot them. Cockle shells are among the most common shells found in middens. A 'midden' is an occupation site where Aboriginal people left the remains of their meals. At some sites substantial deposits grew over generations of use of the same area, and some middens are a few metres deep. When Aboriginal people had visited a certain area, they sometimes intentionally left the waste remains of the food they had consumed as the top layer of the midden pile so that the next people to visit could see what had just been harvested and would choose something else to eat so they didn't over-use the resource . Middens thus represent a blueprint for sustainable harvesting of coastal resources, but are also an archaeological treasure trove. 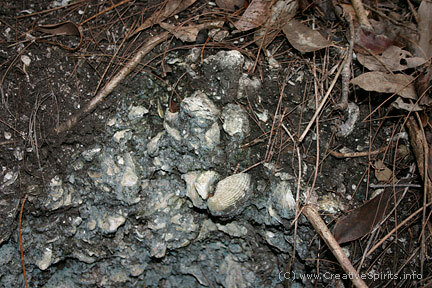 Oyster and cockle shells are most commonly found in middens, as well as animal bones. Some middens also contain artefacts and tools made from stone, bone or shell. Freshwater mussel shells or crustaceans occur in middens further from the coastal or tidal influence. Sometimes burials occurred in middens if the surrounding soil was too hard. Take a look at the Aboriginal shell midden at North Era Beach in the Royal National Park, NSW. Learn about the various thumbnail scrapers, blades, cortex flakes and other stone tools, and debris that can be found outside of the protected midden area. Note that it is against the law to destroy, deface, or damage or desecrate an Aboriginal object or Aboriginal place, or in relation to an object, move the object from the land on which is has been situated. 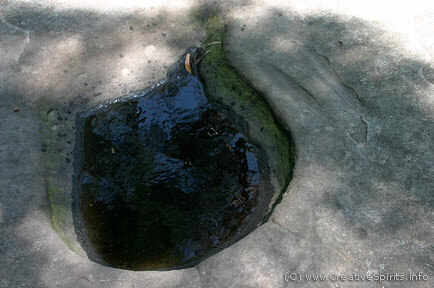 Any natural landform can be a natural Aboriginal site, such as rock platforms, water holes or creeks. A famous natural site of significance are the Three Sisters in the Blue Mountains, two hours west of Sydney. A burial site is a very significant Aboriginal place. Where the ground was soft Indigenous people buried their dead. Sand dunes, middens, rock shelters and sometimes specially constructed mounds were also used for burials. Aboriginal people quarried rock for making tools such as axes. They used ochre and clay for body decoration or painting on rock surfaces and objects. 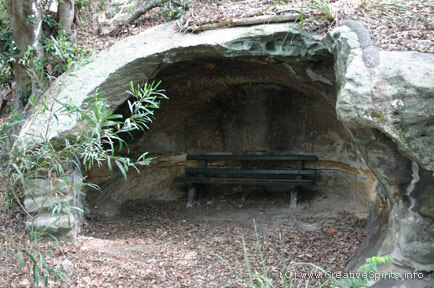 Aboriginal rock shelter which is still sheltering people today. This one is found near Balls Head on Sydney's northern shore. Rock shelters are Aboriginal places if there is a deposit of archaeological material. They are sandstone overhangs were Aboriginal people sheltered or camped, had fire places, produced paintings or stencils, used local food resources or conducted burials. Artefacts are commonly found in archaeological digs at these places. Significant rock shelters are often found close to a fresh water supply. 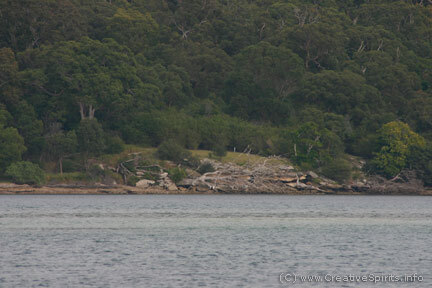 Aboriginal camp site near Port Hacking, NSW. An Aboriginal elder pointed out this Aboriginal camp site which I would have mistaken for just a grassy patch of land otherwise. Open camp sites are places used by Aboriginal people out in the open, rather than in a rock shelter. Open camp sites were used over many generations and were close to useful resources such as fresh water or fish. Camp sites are not easily to distinguish without knowledge. The soil consistency has changed over time which lets vegetation grow lower than in the surrounding area. The site might contain remnants of old fireplaces and implements. Bora rings or ceremonial grounds are usually two circles made of stone or molded earth with an interconnecting pathway. Aboriginal people carried out important ceremonies and meetings within these grounds. Aboriginal rock engravings occur all over Australia. They depict animals, people, tools, implements and important cultural and spiritual figures. Engravings near salt water usually depict fish and whales, but also shields, kangaroos, people or footprints (called mundoes). One of the largest concentrations of Aboriginal rock engravings in the world is found around the Sydney area. Where Aboriginal people where sheltering from the weather they sometimes left rock paintings depicting animals, implements, people or important cultural and spiritual figures. They used white pipe clay, red and yellow ochre, gypsum and charcoal for their paintings or stencils. The sandstone absorbed these materials such that they survived hundreds of years. Drawings and paintings are usually found on vertical or overhanging rock faces. Stencils were commonly made showing hands. The higher such a hand stencil was and the more of the lower arm it included the more important that person's status was. Artefact scatters are places indicating an occupation site and may be found out in the open landscape or in the topsoil of a rock shelter. Artefacts include stone and bone tools such as skinning and cutting tools, wood-working tools, axes, fish hooks or other implements. Scatters provide valuable information about what Indigenous people ate. "They are not dead objects"
Aboriginal people today are re-engaging with artefacts. "They are not dead objects in museums but have a life and meaning in a contemporary context," explains Anthropologist Rosita Henry . Artefacts "link the past with the present," agrees Yirrganydji Elder and historian George Skeene . "It gives an insight into what our ancestors were doing many years ago." Skeene has not problems with German colonists who, during the late 19th century, were avid collectors of artefacts . "We feel that if they did not collect these items they would have been lost forever. I have no malice against the German collector." "I feel that, in a way, he's done us a favour because I could never link the past with the present if he didn't collect these. And he kept them in good condition for more than 106 years." Aboriginal grinding grooves. Because Aboriginal people needed water to wet the surface of the softer rock when they sharpened their tools grinding grooves (top right) are usually found close to water. Axes were made of hard but smooth river stones, firmly fixed to a wooden handle with locally made twine and glue. When the axe head stones did not naturally occur in the are they were traded from other places. When Aboriginal people sharpened their axes, knives or other tools, they rubbed the tool up and back against a wetted softer rock surface like sandstone, until it was sharp. This left grinding grooves behind. 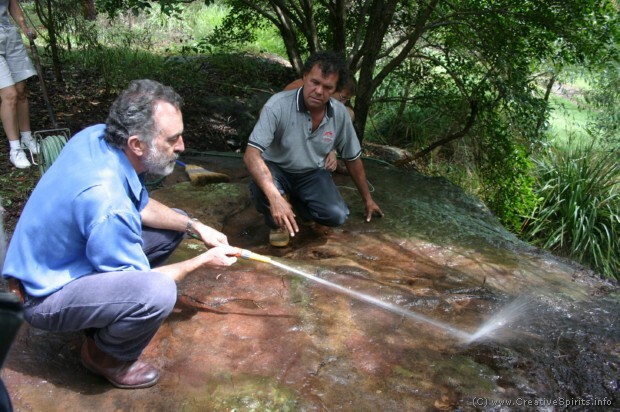 Because Aboriginal people needed water to wet the rock surface grinding grooves are often found near water surfaces or on the lower slopes of hillsides. Aboriginal people scarred trees when they removed bark or wood to make canoes, shelters, shields or coolamons (a carrying container). The tree was injured on one side only which allowed it to survive. Due to development few Aboriginal scarred trees remain in urban areas. In Archaeology of the Dreamtime Josephine Flood uses not only the latest archaeological evidence but also information from myths told by Aboriginal people. More information is available on the Aboriginal Heritage website. Rock Art of the Dreamtime, with numerous photographs, maps and illustrations, is appealing not only to Aboriginal custodians and rock art enthusiasts but also to academic archaeologists. In the 1990s there was just one Aboriginal archaeologist. Twenty years on there were over 20 who in 2010 joined the Australian Indigenous Archaeologist's Association . Dave Johnston, an Aboriginal archaeologist who conceived the association, likes the fact that Aboriginal people are looking after Aboriginal history. "Given that it's our own heritage that is being dealt with when communities, governments or other organisations engage archaeologists, it would be good to know more and more of our own people were qualified to do this work," he says .